Graeme Gathercole’s homebred for Graebar Park Belwazi made her first stakes attempt a winning one in the Listed Kensington Stakes when she flashed down the middle of the track at Flemington on Saturday. 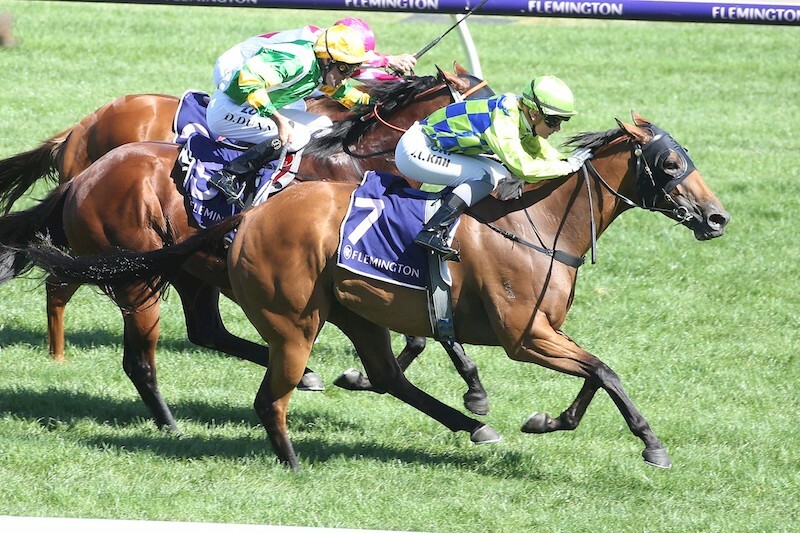 The five-year-old Bel Esprit mare, trained out the Mornington barn of Jerome Hunter, Belwazi was a late nomination for the race but was able to upstage her higher rated opponents to score a valuable stakes win at Headquarters for her connections. A seven-time winner from just 18 career starts, the daughter of Bel Esprit has taken her earnings over the $220,000 threshold and more importantly she has added bold black type to her pedigree page. Operating from a ten acres complex opposite Mornington racecourse, with the backup of a 400 acres state-of-the-art spelling and breeding complex on the nearby Mornington Peninsula which is named, Graebar Park, Hunter trains privately for the Gathercole’s who currently have about 14 in work. According to trainer, Jerome Hunter, “she’s something of a late developer”. Originally taking out his licence around 20 years ago, Hunter was a public trainer for 10 years, then stepped away from the game for five years, before being approached by the Gathercole’s to become their private trainer in 2013. “Graeme and Barbara had only been racing around half a dozen or so by the time I came on board, but we’re heading towards 20 in work, with some 25 broodmares and a wide range of weanlings, yearlings and breakers coming through,” Hunter adds. Ironically, Hunter’s involvement with Belwazi’s pedigree dates back further than that of her breeder/owner. “I trained both Belwazi’s dam, Nkwazi, and her half-sister, Ocean Bridge, for Harvey Parker, who bred both mares,” Hunter reveals. “Nkwazi won over 1000 metre and ended up with Graeme and Barbara as a broodmare, while Ocean Bridge was a very speedy customer. She ended up running fourth in a three stakes races and 200 metres from home in the Group 1 Oakleigh Plate, I thought she had it won (eventually finishing half a length behind River Dove). Belwazi, meanwhile, is Nkwazi’s seventh and penultimate foal, but fortunately for the Gathercoles they have the full sister to Belwazi in Nkwazi’s Daughter and Belwazi to carry on the line. And not forgetting that earlier in the week Bel Esprit also had tactical Advantage win the $150,000 Listed Takeover Stakes during the week. Raced by The Australian Bloodstock, the Gooree Stud homebred Tactical Advantage has been in good form since joining the stable of Kris Lees having won three of his first four starts for his new trainer. Ridden quietly off the pace in this 1200 metre sprint by Brenton Avdulla, Tactical Advantage zoomed to the line to beat the favourite Easy Eddie by a long head. Tactical Advantage is the best of four winners from Group 3 placed Encosta de Lago mare Above Perfection, a daughter of stakes-winner Actress from the family of Gooree Stud’s Group I winners Desert War, Laser Hawk and Romantic Touch. Above Perfection has a yearling filly by Stockwell Thoroughbred’s stallion, Artie Schiller. “Bel Esprit is on fire at present, having posting two stakes winners in three days” said Phil Marshall, nominations Sun Stud.